After the suit measuring we decided to wander the streets around where we were staying and get our bearings and soak in the atmosphere. We were staying on the Kowloon side (Hong Kong spreads across the bay, with half of it being on the mainland and the other half being on Hong Kong island). Kowloon is on the mainland. We were struck by the energy of the place and the fact that it was a lot more "rough around the edges" and slightly more cosmopolitan than Tokyo. I love the fact that you pick up on all the little things when you first arrive in a new place. 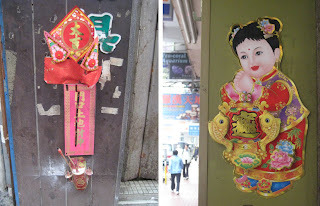 A little "shrine" with incense etc on any of the side roads, and classic Chinese artwork, brightly coloured and used on all sorts of advertising.